Published: Oct. 16, 2016 at 10:41 p.m. Updated: Oct. 19, 2016 at 03:54 a.m. Opportunity is the name of the game in fantasy football. Talent matters, of course, but we want players who see a healthy volume of targets and touches to anchor our lineups, especially in daily fantasy. Every week in the second season of the Opportunity Report, we'll look at all the passing targets for every NFL team and the percentage each player owns. Franchise will handle the backfield touches section this year and his Week 6 piece is tabbed above. The Cardinals are essentially a run-first team now, especially when they get to scoring position. While Larry Fitzgerald and John Brown are seeing a requisite share of the targets, 47.1 percent combined, they aren't enough to be week-in-week-out plays in fantasy. Brown and Fitzgerald are still excellent players, but they will remain high floor options with inconsistent ceilings week-to-week with David Johnson being the engine of this offense and Carson Palmer playing at a visibly diminished level. Michael Floyd once again played as the team's fourth or fifth receiver, taking just 35 snaps on the night. Most of his playing time came late in the game, and 60 percent of his snaps came as a blocker on rushing downs. Jaron Brown's late-game injury may open up a new window of opportunity for Floyd, who did haul in a red zone target for a score, to get back in the coaching staff's good graces. With Mohamed Sanu and Julio Jones absorbing 19 combined targets and 10 players on the Falcons recording a catch, Tevin Coleman's role was minimized. He took just six touches, and saw a mere two targets while playing 44 percent of the snaps. It's beginning to look like it will be impossible for both of the running backs and Julio Jones to record big days altogether. 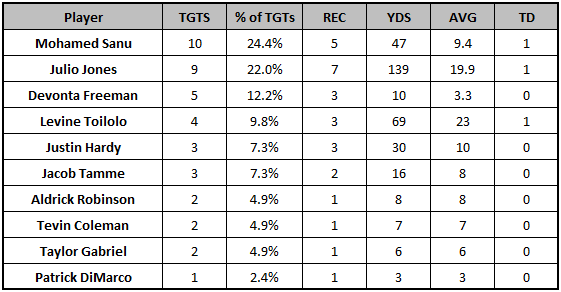 The Falcons want to involve their ancillary receivers in the game, and that spreads the distribution out. With Steve Smith out, Mike Wallace played the role of the No. 1 receiver and it was Kamar Aiken who elevated to the No. 2 position. He out-snapped Breshad Perriman 59 to 51. The Ravens still used their three-wide receiver set on 51 percent of their snaps, after primarily using two-tight ends last week. The Ravens did indeed try to push the ball downfield more with Marc Trestman out of the picture. Joe Flacco had a 7.9 average depth of aimed throw in Weeks 4 and 5 but that jumped to 9.0 in Week 6. The team took a few shot plays to both Wallace and Perriman. This offense could be more explosive going forward, especially with Terrance West showing well as the feature back after complementing his solid rushing with four catches. That is, of course, when Joe Flacco actually plays well. Robert Woods only ended up playing 67 percent of the snaps after sustaining an injury in the game. This was the second week in a row where Justin Hunter scored a touchdown despite having just one catch. He played on only 59 percent of his snaps, so unless Buffalo plans to change up the distribution, he won't make a full-time impact anytime soon. Carolina didn't truly get going on offense, and had an overall inefficient day. They converted just three of 11 third-down chances and averaged just 5.3 yards per play overall. Devin Funchess played more snaps than Corey Brown and Ted Ginn in this game, but capped out at 57 percent while the others were on for 51 and 45 percent, respectively. Funchess made plenty of mistakes in this game, notably getting pushed around by smaller defensive backs including on a Cam Newton interception in the end zone. However, the quarterback showed trust in Funchess and went back to him for a second-quarter touchdown and third-quarter two-point conversion. We still aren't at a consistent point in his play or usage, but at least there were some positive signs in a game that started out rough for the second-year receiver. Cameron Meredith led the team in receiving yards and targets for the second week in a row. He's legitimately putting good play on the field at this point. Alshon Jeffery led the team in snaps and saw more than seven targets for the first time all year. This could be a good indicator for his future outlook, but he still checked in behind Meredith for the team lead in targets. Jalen Ramsey had a strong showing against Jeffery on the 36 coverage plays they faced off, limiting him to five catches for 84 yards on 10 targets. In an effort to keep pace with the high-flying Patriots, the Bengals deployed three wide receivers on 81.5 percent of their plays. As a result, Tyler Boyd saw the field more than usual, taking 80 percent of the team snaps and making a few solid catches for a season-high 79 yards. He still played behind Brandon LaFell (91 percent), who snared his third red=zone touchdown in two weeks. This was the third game in which Terrelle Pryor saw double-digit targets and he is now on pace for 157 for the season. He's now officially a No. 1 receiver in the NFL. The transformation couldn't be any more impressive after starting his career as a quarterback. Ricardo Louis made good on his opportunity as the No. 3 receiver, but he also made a few mistakes, as well. Cleveland doesn't have much to write home about beyond Pryor, which just adds to how impressive his breakout season has been. Dak Prescott continues to keep the distribution and production rather even in Dallas. Cole Beasley and Jason Witten compete for the team lead in targets and operate underneath, while Terrance Williams and Brice Butler pick up the scraps at the outside receiver positions. Trevor Siemian averaged just 4.6 yards per attempt, so the passing production was down as a whole for the Broncos. Demaryius Thomas hit double-digit targets for the first time this season, but Emmanuel Sanders did sustain an injury in this game and played just 60 percent of the snaps. Thomas' slow day despite the volume can be explained by his low 7.6 average depth of target. This was the game we needed to see from Golden Tate, even if it was completely unpredictable. While he was still targeted only 5.6 yards down the field, he averaged 14.6 receiving yards after the catch. Tate still played behind Anquan Boldin (50 to 46 snaps) and was still deployed outside on 83 percent of his snaps. However, perhaps this game is an indicator that he is taking better to his new role as an outside receiver after running primarily slot routes during his first two years in Detroit. Ty Montgomery led the team in targets, but had to play a specialized role in a pinch on Sunday. Per Next Gen Stats, Ty Montgomery lined up in the backfield on 22 of 33 snaps, with the majority of his numbers (six catches and 52 yards) coming out of that position. Montgomery collected the rest of his production when actually lined up at wide receiver. He might just have a chance at another solid floor game as James Starks underwent surgery on Monday, while Eddie Lacy did not look fully healthy with his ankle injury. The Packers play on Thursday night for a short turnaround. Will Fuller was active for this game, but did not play a single snap. He came in carrying an injury and the situation was quite muddled all day on Sunday. If you played him, sorry about your luck; that's the way it goes sometimes. The two tight ends for Houston are starting to get more involved in the offense, as well. C.J. Fiedorowicz is second on the team in targets (19) over the last three games and has a team-leading 185 yards and two touchdowns over that span. Additionally, he has a team-high three red zone targets. It's time for him to be on the streaming radar. T.Y. Hilton's streak of double-digit targets in every game this season came to an end, while the trend of his slower production on the road did hold up. It is painfully evident when watching the Colts offense how much they miss Donte Moncrief. The Colts offer no counterpunch beyond Hilton, especially when Dwayne Allen went down with an injury. Phillip Dorsett has been a huge disappointment for the team, recording just eight catches for 129 yards in four games without Moncrief. He has a way to go before being considered a full-time receiver. This was just the second time this season where Allen Hurns had double-digit targets and just the second game where he's crossed 70 yards. There's an issue behind center, and the Jaguars can't hit big plays anymore because of it. Even Arrelious Benn's 51-yard touchdown came on a pass that traveled less than 10 yards in the air. Among the three players who have seen at least 15 percent of the team targets, only Marqise Lee has a catch rate better than 53 percent. Lee's 73.3 percent catch rate can be explained by his minuscule 6.7 average depth of target, whereas Robinson and Hurns check in at 14.4 and 12.0. Blake Bortles is averaging just 6.3 air yards on his completions this season. It's clear where the problem area is for Jacksonville's offense, and it's their lack of a downfield passing game. The Chiefs controlled this game on the ground, and that took the air out of the passing game. These sort of scripts will happen when Kansas City can play to their strengths. 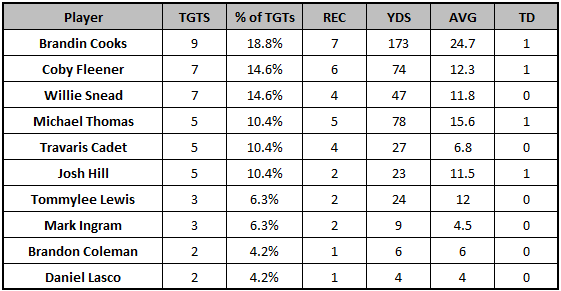 What is concerning for a player like Jeremy Maclin is how widely distributed this passing game has become. What was a highly-concentrated unit between Maclin, Travis Kelce and the running backs last year suddenly has a wide variety of interesting options. Ten Chiefs players recorded a catch on Sunday. The targets foretold that Kenny Britt would have a big game eventually. Britt had registered just one game with fewer than six targets and came in with a 21 percent share of the team total, second to Tavon Austin's 30 percent (but those aren't real targets). Britt has at least four catches in every single game and is now on pace for 1,300 receiving yards. In a plus matchup at home, DeVante Parker turned five catches targets on seven targets into a measly 28 yards. Outside of the second half vs. the Patriots (which the Dolphins began trailing 24-3), Parker has just 12 catches for 169 yards and one touchdown this year. It's hard to criticize after a win, especially such an upset, but the Dolphins still need more from Parker. His presence continues to open up the field for Jarvis Landry, who is on pace for a career-high in receiving yards (1,316) and maintains the highest yards per reception average of his career. In a display of their multiplicity, the Patriots deployed 11 personnel (1 RB, 1 TE, 3 WR) on more plays than any other grouping after their 22 personnel (1 RB, 2 TE, 2 WR) was the leading package in Week 5. The Patriots will continue to mix up their game plan based on the opponent week-to-week. Per Kevin Duffy of Mass Live, the Patriots only used Gronkowski and Bennett together on 27 of 61 snaps but those were some of their best plays. The use of the two tight ends and a pass-catching running back along with LeGarrette Blount still seeing double-digit carries, spells bad news for the wide receivers. Chris Hogan is still a streaky deep threat and just saw one target on Sunday. Julian Edelman leads the team in targets on the season, but has finished no higher than WR30 in any week this season. Pro Football Focus writer Scott Barrett noticed an interesting trend when it comes to the cornerbacks that Cooks tends to struggle and succeed against. Cooks now maintains an average of 94.8 yards in his last 11 home games and a 56 yards per game average his last 10 roads games. Keep these two things in mind when projecting Cooks' outlook for any given week. Willie Snead and Michael Thomas played the same amount of snaps (72 percent) and just barely trailed Cooks (76 percent). Thomas once again hauled in a red-zone touchdown, giving him three in as many weeks. Snead was only targeted at an average of 5.3 yards down the field and played 67 percent of his snaps from the slot. This continues to be a rotational group with the snap count near a dead heat and no player seeing more than 20 percent of the targets on the season. At least the roles are pretty well defined, however. The distribution was pretty well spread out in this one, but Odell Beckham made the plays count when he got targets. The Giants used him outside the numbers and in the vertical game more than they did in Weeks 4 or 5, and the difference shows. Week 5 especially entailed far too many repetitive in-breaking high percentage routes. His presence opened up chances for the rest of the offense. While no one else had a big game, as seven other pass-catchers hauled in multiple passes. The Giants offense was still slow in the first half, so we aren't all the way back yet, but this was a good sign. The Jets got blown out 28-3 and their backup quarterback got into the game, which might explain why the passing distribution is a bit off (ie: why a player like Charone Peake has 10 targets). Patrick Peterson shadowed Brandon Marshall on 25 pass plays and gave up just two catches for 59 yards, including a sterling contested catch by the veteran receiver. The biggest disappointment for the Jets is Quincy Enunwa. The surprising early-season contributor had his best game with Eric Decker in the lineup. However, since Decker went down for the season, Enunwa has just 19 targets for 153 yards in three games. Some more of these young receivers like Peake and Robby Anderson (100 percent of the snaps) will need to step up if Enunwa continues slumping. Amari Cooper rarely squared off with Marcus Peters, who only played 81 percent of the snaps while dealing with an injury, on Sunday. Per Next Gen Stats, Cooper only saw Peters on seven plays, where he collected just 16 of his yards on two catches. 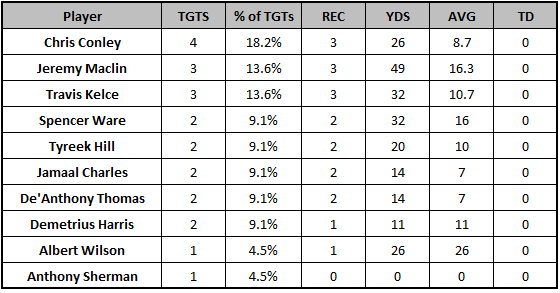 Michael Crabtree, on the other hand, was covered by Peters on 15 plays, and he did not record a catch on any of them. Cooper has been able to rip through two painfully favorable matchups the last two weeks, and he and Crabtree are both in good positions next week against Jacksonville. It will be interesting, however, to see who draws impressive rookie Jalen Ramsey in coverage. The Eagles deployed three or four wide receivers on 79 percent of their plays on Sunday, which meant their top-three spent plenty of time on the field. Jordan Matthews played 92 percent of the snaps, while Nelson Agholor and Dorial Green-Beckham were a nearly dead even at 83 and 81 percent. The distribution of the target share was about what we should expect for the top Eagles receivers, but because the team managed to run just 48 plays, there was not much opportunity to split up. One player who continues to disappoint is tight end, Zach Ertz. After failing to do anything against the generous Detroit Lions tight end defense, Ertz registered just one reception and dropped a potential score. It feels like we are at an "is what he is" stage of Ertz's career. Since 2007 the Steelers are 12-15 on the road when facing teams with a less than .300 winning percentage. We should expect these sort of duds from Steelers players in these sort of situations, which is why players like Sammie Coates were virtually unplayable in Week 6 despite a huge Week 5 game. Coates was also playing with a lacerated finger, and he played just 30 percent of the snaps. Eli Rogers played 57 percent of the snaps in his return to action. With Ben Roethlisberger undergoing surgery for a torn meniscus, give the entire Steelers offense a downgrade. Pittsburgh averaged seven fewer points per game and 145.3 fewer passing yards per game with Landry Jones and Mike Vick under center last season. It appears that the torch has officially been passed in the Chargers tight end room. Hunter Henry is breaking the lack of contributions from rookie tight ends rule. He has 290 yards and three touchdowns in his last three games. For the second straight week, Henry (68 percent) played more snaps than Antonio Gates (48 percent). Henry leads the team in red-zone targets (three) and touchdowns (two) over the last two games with Gates in the lineup. Week 6 was a bad blip on the radar for Travis Benjamin. Despite seeing five targets to lead the wide receiver group, he played on just 38 percent of the offensive snaps. Perhaps he was in the doghouse for muffing a punt early in the game. Colin Kaepernick's insertion into the starting lineup was apparent right away in Torrey Smith's stat line. Smith hauled in a long touchdown on a blown coverage play courtesy of the Bills. However, the point is that Kaepernick at least attempted it. His average depth of aimed throw today (11) ranked third among Week 6 passers and dwarfed Blaine Gabbert's 8.7 average this year. More lines like two catches for 12 yards might be in the cards for Jeremy Kerley going forward. Jimmy Graham has displaced Doug Baldwin as the top target in Seattle, or at least has made this a close 1a, 1b situation. Graham leads the team in targets (26), catches (18) and yards (302) over their last three games played. His emergence, along with a surprising role as a pass-catcher for C.J. Spiller, has made the other pass-catchers unpredictable on a weekly basis. Tyler Lockett did indeed see his offensive snaps rise to a 63 percent share, but didn't make much of a dent in the target rotation. He could explode anytime, but the situation will need to change for him to break out. With Christine Michael handling 18.6 carries per game the last three weeks, that change will also need to extend to the running game. Despite seeing three times the amount of targets as the next highest receiver, Kendall Wright only played 35 percent of the snaps. He took 75 percent of his snaps from the slot, so he was able to take advantage of the middle of the field coverage that had allowed by far the most yards to tight ends entering Week 6. Given his minuscule playing time, it's hard to project him for reliable production going forward. At the same time, he ran good routes and made an impact at a position of need for the Titans. 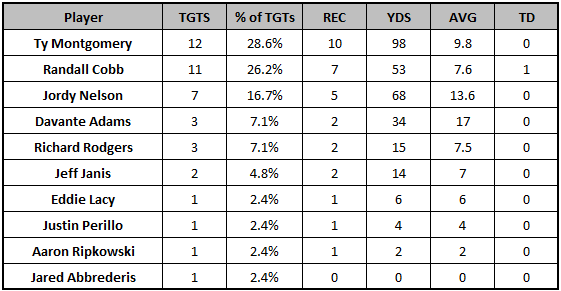 Once again Pierre Garcon led the team in wide receiver targets and snaps. DeSean Jackson did not get a "squeaky wheel gets the grease" or revenge game treatment, and actually played behind Jamison Crowder with a 67 percent snap rate. Crowder's usage may have been a byproduct of Jordan Reed's absence as they run similar routes despite their positions technically being different. Jackson has lived up to his reputation as an unpredictable streaky player this year even more than usual. He has just 95 yards over his last three games.